At the Liebherr 2017 World Championships in Düsseldorf earlier in the year, in the fourth round of the Men’s Singles event when facing colleague, Xu Xin, he held a commanding seventh game lead and suffered defeat. 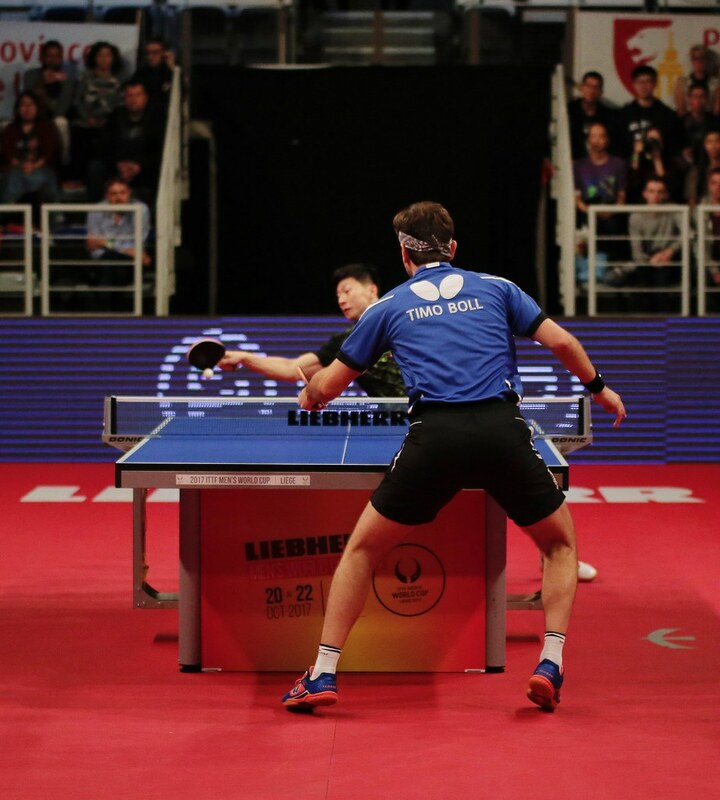 Now, some five months later when opposing Germany’s Timo Boll, on Saturday 21st October, at the quarter-final stage of the Liebherr Men’s World Cup in Liège, Belgium, China’s Lin Gaoyuan was once again in control in the deciding game; incredibly once again he experienced the same fate. In Düsseldorf he led 10-5 in the deciding game, only to lose the next seven points; in Liège, the no.6 seed, facing Timo Boll, the no.3 seed, he led 10-4 in the seventh game. He looked home and dry, he lost the next point; immediately Liu Guozheng, the Chinese national team coach sitting courtside, called “Time Out”. The break did not work, Timo Boll levelled at 10-all; before then saving yet another match point when down 10-11. In fact it was the seventh match point he saved; in the sixth game Lin Gaoyuan had a major opportunity to bring matters to a conclusion when leading 12-11. Focused, Timo Boll once again gained parity at 11-all, before winning the next two points to secure what must be one of the most sensational wins in an international career that goes back over two decades! The record reads a seven games win in favour of Timo Boll (5-11, 11-13, 11-9, 9-11, 11-9, 14-12, 13-11), it doesn’t record one of the most incredible recoveries in Men’s World Cup history. “It was a crazy match and I had to fight because this is my living room. I just felt I had to fight in this wonderful arena with the huge support from the fans and I was lucky as well. I think I have to use the next 20 minutes to enjoy this victory.” Timo Boll. That moment when you save 7 match points to beat a top Chinese player and make the Men’s #ITTFWorldCup Semi Final ??? Success for Timo Boll means that in what is now 14 appearances in the Men’s World Cup, he has now reached the semi-final stage on nine occasions. A dramatic win for Timo Boll meant that an all-Chinese semi-final was avoided. Earlier in the evening Ma Long, the top seed, had beaten Japan’s Koki Niwa, the no.5 seed, in five games (13-11, 11-9, 11-5, 9-11, 11-8). “I was leading in the fourth game and I made some errors; that’s why I lost the game. I remained focused playing just one point at a time. I am not thinking of the title just playing one match after another.” Ma Long. In what is now six appearances in the Men’s World Cup, Ma Long has always reached the semi-final stage. Ma Long versus Timo Boll awaits in the penultimate round.